Every now and then we get requests from a developer using Windows, or a Windows-using participant at one of our workshops or events. Windows support is considered “experimental” for all components except Telegraf, but the full TICK Stack will still build and run on the platform, and we provide binaries for Windows on our downloads page. So while Windows is not an officially supported operating system and is not recommended in production, we wanted to provide some additional resources for those adventurous developers who still want to get up and running on the platform. This post will go over details of installation and configuration natively on Windows, and then touch briefly on some alternative approaches for running the TICK stack, such as Virtual Machines or Docker. Ed: If you’re interested in official support from InfluxData on Windows, you can always reach out to our sales team! We’re sure we can come up with something. The following instructions were tested using Microsoft’s Windows 10 Development Environment VMs. If you’ve installed the applications in the directories above, each application should start using its default configuration. First, let’s start up InfluxDB. One option to run the application is to double-click the executable, but if something goes wrong the window will close as soon as the program exits, and you probably won’t have time to read any errors that are displayed. Instead, we’ll open up a Command Prompt for each application and use the commands from each section below to run the individual applications. You can launch a command prompt by opening the Start menu and typing cmd.exe. If you want to run the Influx command-line interface, you can use the influx.exe command. If you’re using the default configuration, it should connect automatically. Telegraf is a single binary but requires a configuration file to start up. If you’ve installed the contents of the Telegraf download as described previously, it will automatically find the configuration. For more configuration options, please refer to the sections below. Let’s bring up Chronograf and go through the final steps required to get everything set up and working. The defaults provided should work for us, so we can click “Add Connection”, after which we should see the main Chronograf interface. 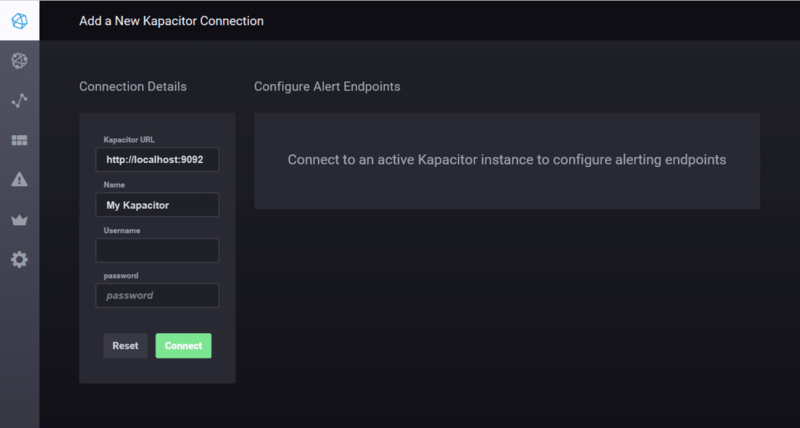 We also want to connect our Kapacitor instance at this time; first, navigate to the “KAPACITOR” section of the page. Then, next to “Influx 1”, click “Add Kapacitor Connection”. Again, the default values should be sufficient for us, so click “Connect”. That’s it! We should be good to go. Both InfluxDB and Kapacitor use default configurations if no configuration file is provided, while Chronograf doesn’t use a configuration file at all. Telegraf, as mentioned previously, looks for its configuration file in the C:\Program Files\Telegraf\ directory. If the default configurations don’t work for you for some reason, you can refer to the sections below for more information about how to customize your configurations. InfluxDB’s configuration can be set either through a configuration file, or through environment variables. Any parameter from the config file can also be represented as an environment variable. There is a default configuration file included in the download, which will end up in C:\Program Files\InfluxDB if you extract all the files from the archive; however, this file specifies some Unix locations for files and isn’t used by InfluxDB by default. Like InfluxDB, you can find a sample configuration included in the download, but it won’t be automatically loaded when you start the application. Telegraf on Windows looks for configuration files in a few locations. $TELEGRAF_CONFIG_PATH, /.telegraf/telegraf.conf,C:\Program Files\Telegraf\telegraf.conf. Both InfluxDB and Kapacitor need to store data on disk. On Windows, these files end up in subdirectories in the user’s home directory. InfluxDB creates .influxdb and Kapacitor creates .kapacitor. The influx.exe command line client also writes data to the user’s home directory, in the form of an .influx_history file. 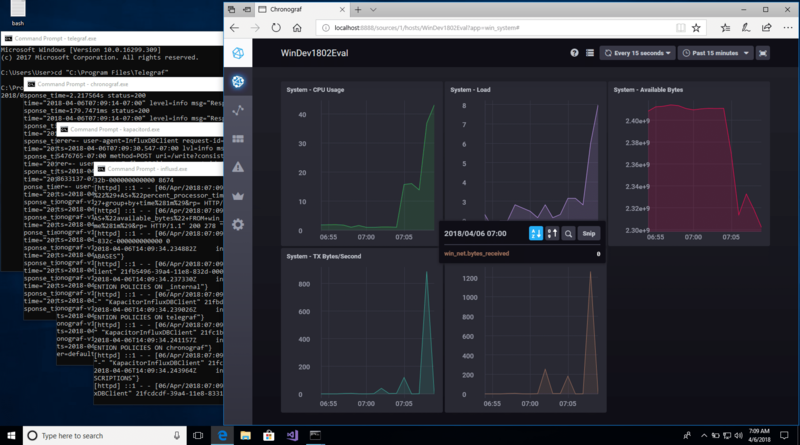 We don’t currently have plans to support running InfluxDB on Windows as a service, but if this is something you absolutely need, you can set up a user-defined service using these instructions from Microsoft. From Source: If you’re interested in making changes to the applications, and perhaps contributing back to the community, you’ll want to download the source code from GitHub and compile it yourself. All you’ll need is a recent version of Go! Docker: InfluxData provides a Docker sandbox that includes Bash and Windows Batch scripts to get you up and running, as well as a Docker-compose file. It’s a great place to start if you’re a Docker for Windows user. Virtual Machines: A VM is a great option if you need to run the TICK Stack in a Linux environment (perhaps to match your deployment environment), but you only have a Windows machine. Hyper-V and VirtualBox will both let you run VMs on Windows, and Vagrant can help you create a reproducible environment. We have a blog post with some more details on using Vagrant, but you’ll have to update the instructions to use the latest versions of the TICK Stack. If you’re using Windows and have specific questions, feel free to post to our community site or reach out to us on Twitter @InfluxDB. I’ve been running TICK stack on windows for almost a year. It works great. We use Windows containers to host influx and chronograph. Telegraph runs directly on the VMs. I’m using InfluxDB on Windows, but I was not aware that this is not officially supported so I hope that InfluxDB (being the core of the TICK stack) will be fully supported soon! We are using InfluxDB to store temperatures / pressures and digital signals from PLC’s and that world is still havely relying on Windows as it’s main platform. Are there plans to support Windows in production eventually? I am playing around with the telegraf and getting some of my VM and Physical servers into Chronograph and of course before i knew what I was doing I have some hostnames in Chronograf I would like to get rid of, How do I do this?